Hi! 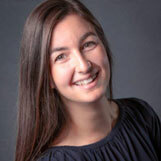 My name is Lauren Gius and I am a Speech Language Pathologist working here at CCHAT. I was lucky to begin my journey working with hearing impaired students while pursuing my Master’s Degree at San Jose State University. There I was able to begin my Auditory/Oral Training, and was given a life-changing opportunity to work at CCHAT as an intern. Now it has come full circle to be able to join this amazing team of professionals to continue to foster my passion of working with children with hearing loss. I am so lucky to be a part of this team. Outside of work I am an avid reader and love to travel to new places. I also love watching baseball and have been rooting for the San Francisco Giants since I was a kid. I am looking forward to all of the experiences I will get to make working at CCHAT.